I stayed here from Saturday til Monday (April 13-15). I checked in around 10 AM. The room was not yet available but they expedited the process. Before noon, my room was already available. Although I am not in the hotel at that time, they emailed me. They also brought my luggages to my room. My hotel room is clean. I had a good sleep during my stay. Breakfast is good as well. More importantly, the staff are friendly and helpful. I will definitely stay again at this hotel when I am in Rome. I had a pleasant stay here. Amazing hotel. Great location and unbelievable service. The staff was absolutely amazing. Great room and super clean. Breakfast was great and included items that were not on the buffet at no charge. Highly recommend staying here! 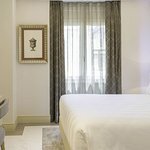 Thank you so much for your recent stay at Aleph Rome Hotel Curio Collection by Hilton and for giving our hotel and staff a great review. We are happy to hear that we were able to impress you with our service, accommodations and amenities. It was our pleasure having you, and we look forward to seeing you on your next trip to the area. Very pleased . More than happy with the hotel and the accommodation . First time in Italy and had a great experience with the exception of viator. They were terrible and do not recommend their Company for any tours. Beautiful, clean hotel minutes away from central Rome! The staff was friendly and attentive and the rooms were clean. We stayed in the king room with the terrace which is a must! Loved my stay and would recommend 100 percent! Thank you very much for your kind comments ! It is a great pleasure to read your positive feedback and to learn you had a wonderful stay. I will immediately share your comment with our Team. I look forward to welcoming you back soon, hoping that the future stores many more opportunities for you to stay with us.